Welcome to the Jack Lewis Family Page, compiled by his daughter, Mary Young. for his descendants in Scotland, England, Canada, U.S.A., New Zealand and Switzerland. If you have further knowledge, photographs to contribute, or just feel like a chat, please contact Mary via the footer link on this page. JOHN (JACK) LEWIS was born at 13 Inglis Street, Glasgow on 3rd September 1897, son of JOHN LEWIS, journeyman hairdresser, and AMELIA DICKSON MATHER, paper bag maker. John was only 20 and Amelia was 18 when their son was born; sadly there were no other children. Jack was only 17 when he married ELSPETH (ALICE) MITCHELL GRAY BEATSON, aged 20. He was already in the Territorial Army, so perhaps the marriage was rushed because he was called to war. Jack was posted to Egypt in May 1915. There is a family story that he served at Gallipoli. 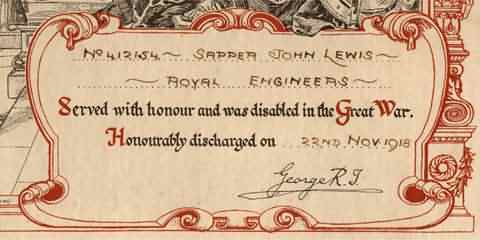 Jack was on home leave in summer 1916 - his first child, John, was born the following March. By the summer of 1917 he was back on active service in Europe. 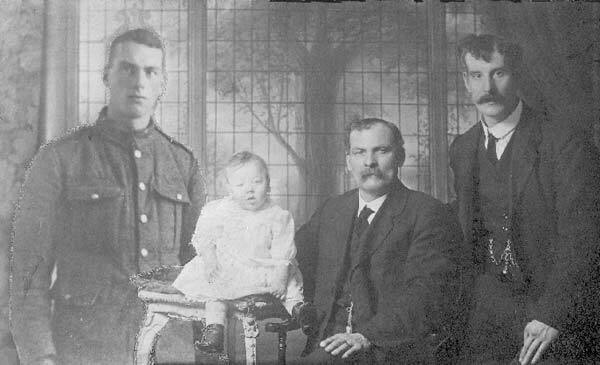 Jack, in army uniform, has been 'cut and pasted' into this studio portrait of "The Four Johns" (grandfather, father, Jack himself, and baby Jackie). Toll Corner War Memorial In 1921 Jack Lewis was invited to unveil a War Memorial to "The Toll Boys", twenty-nine fallen comrades in Port Glasgow. I wonder whether he had enlisted with this group of young men, perhaps his workmates in the shipyard? He was proud of the gold medallion presented to commemorate this event. This medallion and Jack's war medals are still in family hands. Jack and Alice's first child, yet another JOHN (Jackie) LEWIS, had been born on 5th March 1917 at Alice's family home in Kinghorn, Fife. 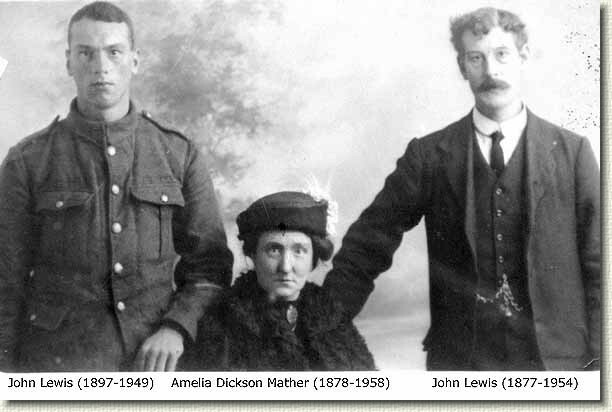 A daughter, JANET SUTTIE GRAY LEWIS, followed in 1919, and finally another son, JAMES BEATSON LEWIS, in 1924. After the war, the family settled in Kinghorn where Jack ran a shop in the High Street. Later they moved to Bonnyrigg near Edinburgh. Sadly, Alice died in January 1931, leaving John with three schoolchildren to care for. But he was not alone for long! Within the year, he had moved the family to Edinburgh and married Hannah Hoggarth, a Yorkshire lass. On 17th October 1931 at 369 High Street, Edinburgh, by declaration in presence of James Graham, 10 Little King Street, Edinburgh, and Jessie Miller, 17 Heriot Row, Edinburgh. JOHN LEWIS age 33, widower, artificial flower maker of 10 St Leonard's Lane, Edinburgh, son of John Lewis, hairdresser, and Amelia Dickson Mather, married HANNAH ABIGAIL HOGGARTH age 22, domestic servant, spinster, of 17 Heriot Row, Edinburgh, daughter of Stephenson Hoggarth, farm labourer, and Charlotte Annie Clubley. (Jack was making Armistice Day poppies in the Earl Haig Poppy Factory, a charitable workshop for disabled ex-servicemen; Hannah was a parlourmaid in a posh mansion house in Edinburgh). Jack was probably behind the camera in 1941 when this photograph was taken. 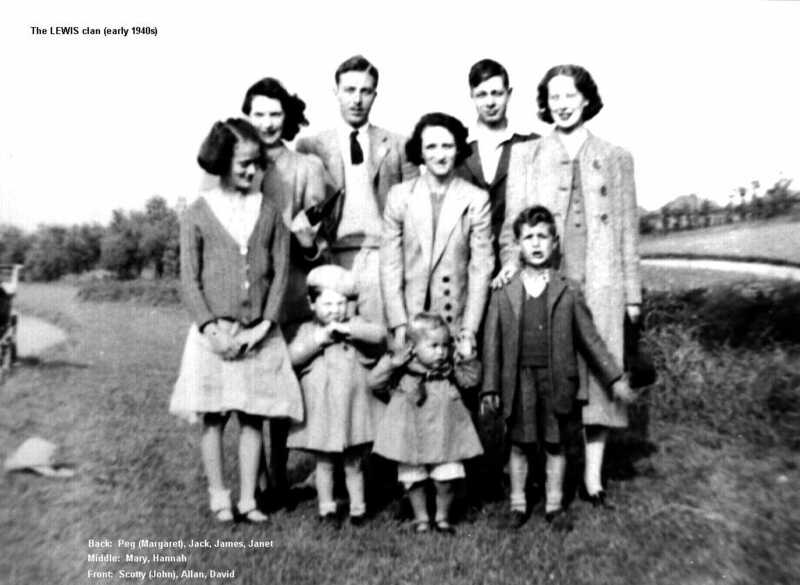 It is the only photograph we have of all his children together, plus his second wife Hannah, daughter-in-law Peg and grandson Ian (Scotty). It must have been taken in 1941. 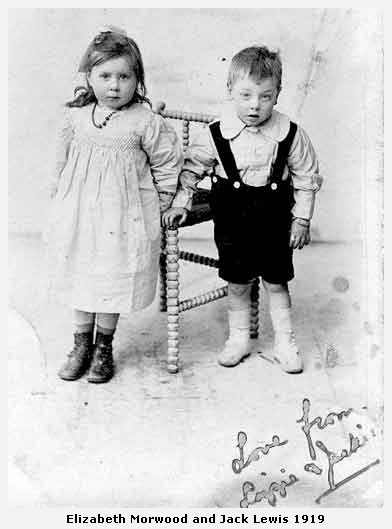 Allan (born March 1940) is a toddler and Janet died in January 1942. 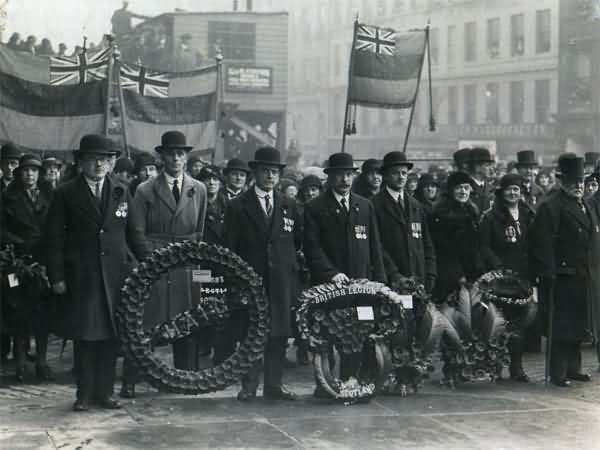 Armistice Day was always a special time of pride and sadness, processions and poppies. Jack worked for a time making poppies at the Earl Haig Factory in Edinburgh, a sheltered workshop for army veterans. He was a member of BLESMA (The British Legion Ex-Service Men's Association) where he found much friendship and support. Although he died 30 years after the end of World War I, the British Legion successfully fought the case for his widow to receive a War Widow's Pension. 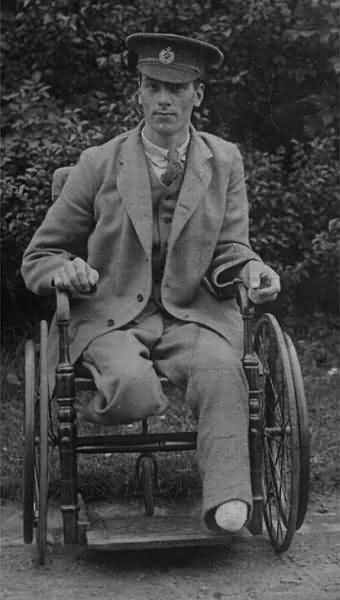 JACK LEWIS died suddenly on 4th July 1949, during a family outing to North Berwick. JOHN LEWIS age 51 poppy maker, married to (1) Alice Beatson, (2) Hannah Hoggarth died 4th July 1949 at 8.10pm in High Street, North Berwick (usual residence 42 Northfield Broadway, Edinburgh); parents: John Lewis hairdresser and Amelia Dickson [error, she was Amelia Dickson Mather]; informant Hannah Lewis widow, present. 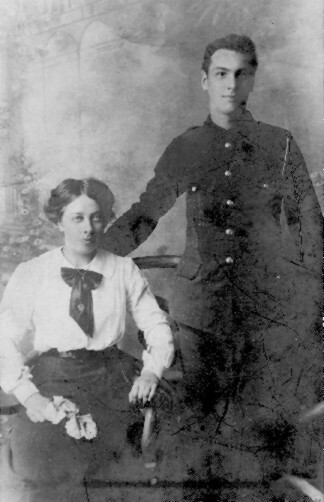 Jack was laid to rest in Liberton Cemetery beside his first wife, Alice Beatson and their daughter Janet. Jack's paternal grandparents were JOHN LEWIS (Welsh) and EDITH LETITIA BANKS (Irish). They married in Workington, Cumberland, England in 1876 and were still there at 1881 census. They had moved to Glasgow by 1891 census. Their children were: John, Eliza Ann, George John and Edith (twins), Mary and Thomas (twins), Louisa, Martha Bruce, Edith, David and Joseph. Until a few years ago I had not attempted to research these Welsh and Irish connections. Now we have an explosion of new information, contacts with cousins etc. see my Legacy Family Tree on this website.